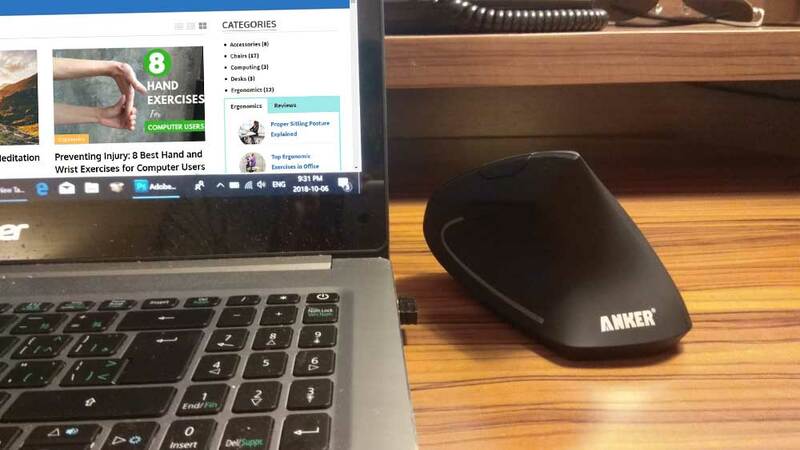 The Anker 2.4G wireless mouse has been one of the best selling vertical mouse since its debut 5 years ago. 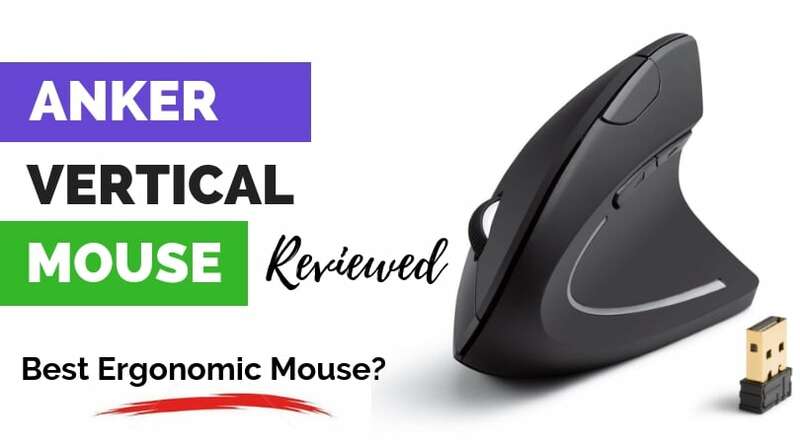 With over 6,500 reviews on Amazon and an exceptional 4/5 star rating, here’s our thorough review of the mouse after spending two weeks with it to see if it’s worth all the hype and accolades. The result is a bit of a mixed bag. In terms of value, this is probably the best vertical mouse you can get in the $20 price range. Its tall vertical design does minimize much of the wrist movement associated with RSI and carpal tunnel syndrome. However, people with small hands will find the browser back/forth buttons hard to access. The surface of the mouse is also a tad bit slippery for me. Optical sensor that works on glass surfaces as well. 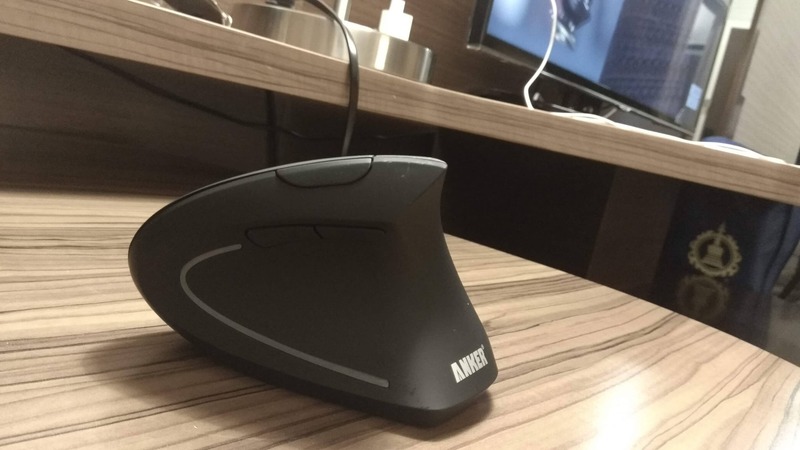 The Anker Vertical Mouse is rather tall, especially compared to any traditional mouse. Measuring 3.98L x 3.23W x 3.15H inches, the hallmark of the mouse is its vertical design that will have you holding it by assuming a handshake position. With the hand almost perpendicular to the desk surface, there is little twisting of the wrist as you hold the mouse. If you already suffer from carpal tunnel syndrome, you can completely eliminate any wrist movement by pushing the mouse with your arm to maneuver the cursor, instead of twisting the mouse from side to side as you would in a normal mouse. 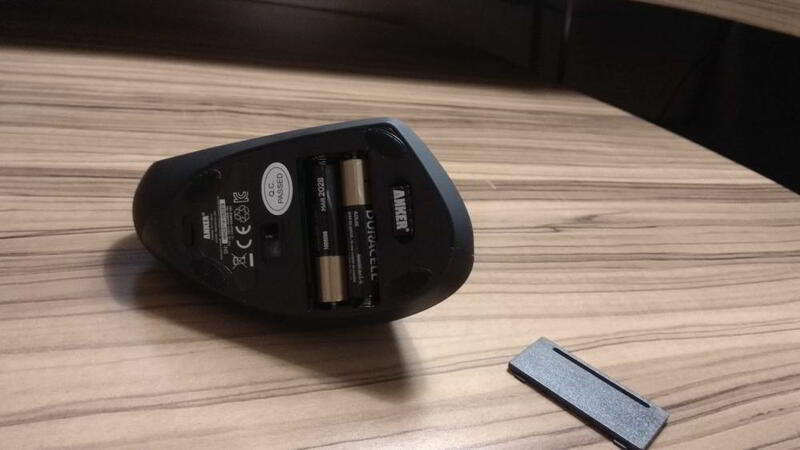 Like most vertical mouse, it takes some time to get used to operating the Anker Vertical. With the main buttons on the side, my hand is positioned in a way that has the side of my palm and wrist resting on the desk at all times, compared to a regular mouse where you’re resting the whole of your wrist. As mentioned, this position does minimize the twisting of the wrist relative to your forearms, and supposedly helps reduce the chances of developing carpal tunnel syndrome according to many experts. Combined with using your arm to maneuver the mouse, and you can keep your wrist completely stationary when operating the Anker mouse. Either way, after a couple of days I started to get the hang of it all, and maneuvering all 3.46 ounces of this contraption around felt natural. The Anker Vertical is made mostly of plastic. For a mouse that costs so little, it feels surprisingly premium. The surface looks matt, though has a slippery feel to it that to be honest I’m not a big fan of. A more rubberized surface would have worked better with a mouse that features so many steep contours. The Anker Vertical Mouse uses 2 AA Batteries for the wireless version that should last a good 3 months (batteries not included). A USB receiver that can be stored underneath the mouse when not in use pairs up with your PC or Mac to create a 2.4G wireless connection that gives me an effective range of around 3 feet. Not bad, and more than adequate unless you’re looking to control your smart TV or something with the mouse. 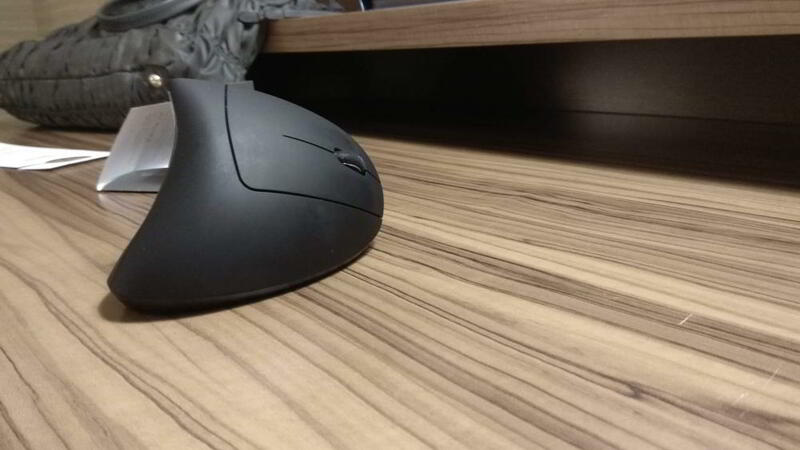 In terms of sensor the Anker Mouse uses optical technology. It works nicely even on my glass coffee table, unlike laser technology. Three levels of DPI are supported- 800 / 1200 / 1600 for different levels of mouse sensitivity. Ratcheting scroll wheel that when clicked automatically scrolls the page in all four directions. All of the features work well, with the exception of the back and forth buttons for me. They are positioned too high up and at a strange angle that makes them very difficult to reach with my thumb. My hands are considered small btw. The main left/right buttons and scroll wheel on the other hand are large, easy to access, and very responsive. I really like the physical DPI switch on the Anker Vertical Mouse. Instead of fumbling with software each time to adjust the mouse cursor sensitivity, a click of the button changes between 3 levels of sensitivity with ease. 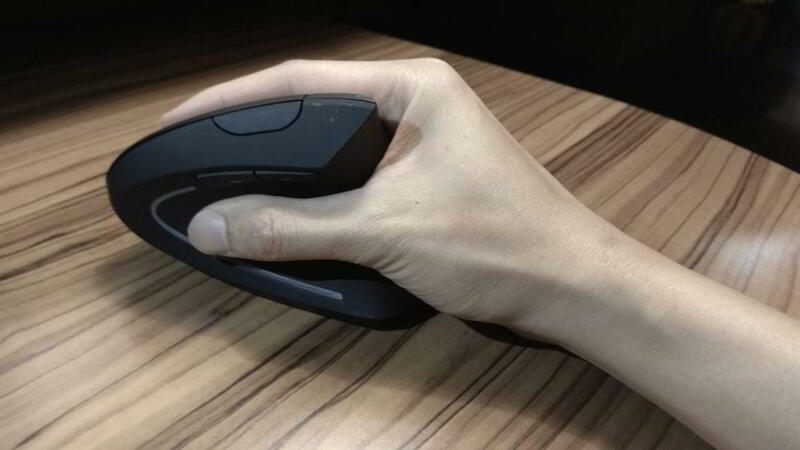 If you suffer from carpal tunnel syndrome, toning down the mouse’s DPI – or sensitivity – can help in preventing the condition from getting worse, according to some studies.